Moles may be referred to as beauty marks, freckles, or nevi and are usually benign spots that appear on the skin in childhood or adolescence. However, moles with certain characteristics may be cause for concern and need further evaluation to rule out melanoma. Moles occur when pigment-containing cells, known as melanocytes, grow as a cluster. They can be found on any area of the body including the scalp, between the toes, and under fingernails. Most moles appear during childhood and adolescence and may normally change as the individual ages. 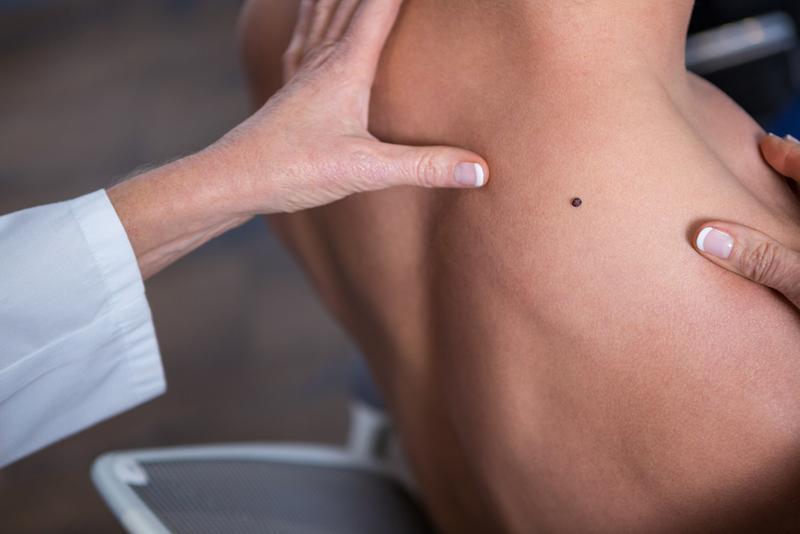 However, when new moles appear during adulthood, patients should take care to monitor them following the ABCDE pneumonic for skin cancer screening. Patients should see their doctor for any asymmetry, border irregularities, color changes, diameter increase (especially larger than the size of a pencil eraser), and evolution of the mole from month to month. The typical mole tends to be uniform in color, round in shape, flat or slightly raised, and does not exhibit any changes. Atypical or dysplastic moles can look like melanoma, but are non-cancerous. These moles may be more than one color, irregularly shaped (not round), and larger than 6 mm. Patients with four or more atypical moles, a past history of melanoma, or a first relative that has had melanoma are more likely to get skin cancer. Common moles refer to any mole that was acquired after birth and are usually harmless. However, having 50 or more common moles increases a patient’s risk for melanoma. Moles can be diagnosed on physical exam and biopsied when additional information is needed. Moles are often left untreated, but can be removed if they are physically or aesthetically bothersome to a patient. Surgical excision involves cutting the mole out of the skin and examining it under a microscope to evaluate for any abnormal cells. A dermatologist can also perform a surgical shave of a mole by using a blade to remove it. To learn more about mole treatments, melanoma screening and prevention in Hagerstown or the surrounding Frederick area, contact us today to schedule a consultation.